Aston Villa have confirmed the signing of West Ham defender James Collins for a fee believed to be about £5m. Villa agreed a fee on Tuesday morning and the 26-year-old Wales international later accepting personal terms. 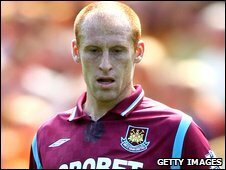 Centre-back Collins started his career with Cardiff City before moving to West Ham for £3.5m in July 2005. Villa are also close to signing Manchester City central defender Richard Dunne as they look to bolster their defensive numbers. "It's been a mad 24 hours since coming up here but I'm delighted to have it all sorted," said Collins. "I came on Monday and met the manager and had a look around. It's a fantastic setting. I just can't wait to get cracking now. "Aston Villa are a massive club so after coming here looking around the place - and I'm friendly with a few of the boys as well - it didn't take a lot of persuading on my part." Collins, who turned down a move to Stoke two weeks ago after failing to agree terms, arrived on Tuesday morning at Villa's Bodymoor Heath training ground to try to finalise his move and complete a medical. He has featured in all of West Ham's league games so far this season, appearing 60 times in total during his time at the Hammers. The player, capped 28 times by his country, made 86 appearances for Cardiff before moving to Upton Park in 2005 along with Bluebirds team-mate Danny Gabbidon. A knee ligament injury in January 2008 kept him on the sidelines for nine months. Villa have been left short in defence following the retirement of Martin Laursen and the sale of Zat Knight to Bolton.